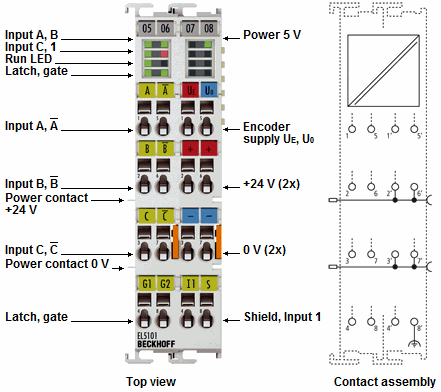 The EL5101 EtherCAT Terminal is an interface for the direct connection of incremental encoders with differential inputs (RS485). A 32/16 bit counter with a quadrature decoder and a 32/16 bit latch for the zero pulse can be read, set or enabled. Incremental encoders with alarm outputs can be connected at the interface’s status input. Interval measurement with a resolution of up to 100 ns is possible. The gate input allows the counter to be halted. The counter state is taken over with a rising edge at the latch input.